The critically-acclaimed Lydian String Quartet came to UB to perform in the Slee/Beethoven String Quartet Cycle on April 24 at Lippes Concert Hall. They also participated in a Composer Workshop the following day in Baird Recital Hall. Aubrey Byerly (left), a graduate student in composition, had the privilege of hearing her string quartet-in-progress played by the ensemble -- an outstanding perk for an emerging composer, and part of a process that began last fall with a previous visit from the group. "My work with the Lydian Quartet has been a long, interesting, and rewarding learning experience," says Byerly. "The entire process began last fall, when I wrote two short passages of music for a reading with the intention of expanding it into complete piece. The Lydians came from Brandeis to play in the Slee Beethoven Cycle Series and graciously agreed to read the fragments of my piece. The reading was very informative, as a young composer I need experiences like this to build up a reservoir of experience to draw upon to finish this piece and for future pieces. It can be easy to slip into a compositional vacuum, so getting to hear things I have written grounds me in sonic reality. I was able to have them play several variations of passages to get a better sense of the acoustic realities of the ensemble, what voicings sound robust, gnarly, velvety, acerbic, and so on. I also learned quite a bit about how an ensemble like Lydian practices and learns pieces, which has informed the way I illuminate the ideas I am trying to convey in my score and the music. Being young and inexperienced, I feel quite timid around such accomplished musicians and need practice in trying to ask for what I want; so I also value the interpersonal aspect of working with an ensemble in this kind of setting. They have been very accommodating, have made countless helpful suggestions, and have taken great care to realize my ideas. "Since their visit to University at Buffalo last fall, I have spent several months filling out the piece from its original fragments and revising... There have been many emails between the performers and myself, emphasizing their dedication to music and a desire to realize my ideas. I am already looking forward to the next revision, in order to integrate the knowledge and many insights they will bring with them. Through University at Buffalo's unique Center for 21st Century Music, the Lydian Quartet has provided me with a unique opportunity, which I could not have anywhere else, for which I am grateful." We interrupt our look back at the 2008-09 season for a few words from Sequenza21 regular (and SUNY Fredonia composition prof) Rob Deemer. After Deemer posted his first JiB review, he agreed to submit a report for our own blog, focusing on the Friday, June 5 evening performance that featured the Slee Sinfonietta along with soloists flutist Mario Caroli and mezzo-soprano Julia Bentley as well as a solo performance by flutist Lindsey Goodman. Deemer writes, "While the audiences' necessary proximity to the stage caused occasional challenges to holistically experience the combination of acoustic and electro-acoustic, the overall concert was a huge success and quite thought-provoking. "Commencing with the largest ensemble first, Brad Lubman calmly and expertly directed the Slee Sinfonietta strings, piano & percussion through David Felder's Inner Sky, a tour-de-force for master flutist Caroli that pitted the soloist (on piccolo, flute, alto flute and bass flute) against both the chamber orchestra and electronics, creating a richly dense texture. Beginning what would become a graduate thinning of textures throughout the concert, Bernard Rand's Now again - fragments from Sappho allowed the audience to experience each line within the chamber ensemble supporting Bentley, who wrung every drop of emotion from the ancient text, while creating a wonderfully unique sound of two female singers acting as a small chorus within the ensemble. "After two intensely challenging works, one did not expect to see flutist Lindsey Goodman to take the stage by herself...and a toy dog in a basket! Such an introduction, however, was just what was needed for Matthew Rosenblum's tongue-in-cheek work for solo flute and electronics, Under the Rainbow. Incorporating the intricate flute part into the schizophrenic kaleidoscope that emanated from the speakers seemed to be a walk in the park for Goodman, who was into the character enough to slyly gesture to her ruby slippers at the appropriate time without seeming like a performer trying to act. I'm not sure what was more satisfying: the work itself or Goodman's performance, but nevertheless the performance encapsulated the entire concert - so much to enjoy that you'd have to see it again to catch what you missed the first time." In addition to his activities as a journalist and composer, Deemer directs the Fredonia-based Ethos New Music Society. If you're a reader of this blog living in western NY, you'll definitely want to check out the group's upcoming season. Continuing our wrap-up of the past season: on April 10, the Center for 21st Century Music joined forces with Buffalo-based ensemble A Musical Feast to present GUSTO at the Gallery, a program of contemporary works at the Albright-Knox Art Gallery. Pieces by Xenakis, Mozart, J. T. Rinker, and Mexican composer Mario Lavista were played by UB faculty members Tom Kolor (percussion), Alan Feinberg (piano) and Jonathan Golove (cello), among others. Percussionist Rin Ozaki played J.T. Rinker's Frigate, scored for crotales and computer and premiered at June in Buffalo in 2008. Says Rinker, "I've always loved the sound of the crotales, and thought about what a computer might add that other instruments couldn't if paired with the crotales. As one of the highest pitched instruments of all it seemed only fitting to add a higher part (the crotales never gets to be a cantus firmus or play the role of providing a fundamental) for the instrument... with the idea that pitches/frequencies lower than the instrument could be created using difference tones. As each set of crotales is different the exact result is hard to predict, but it is true that in some parts of the piece the computer part only becomes apparent (is otherwise inaudible) when the crotales are played. "I know that doesn't explain the title very well. Mostly I like the way the word 'frigate' sounds (just like I like the way the crotales sound), but big picture is that frigate is the first of a group of pieces for solo percussion instruments and computer that will all be named after ships of sail. At the moment I haven't started another piece so Frigate sails alone in search of its imaginary fleet/sister ships." The Slee Sinfonietta gave a characteristically absorbing program at Lippes Hall on April 7. Christian Baldini conducted works by UB faculty member Jeffrey Stadelman (Eventyr) plus recent composition grads Derek Charke (The Winds of Winter) and Evan Johnson (down / among the altitudes). Charke's The Winds of Winter, for amplified solo flute and twelve-piece chamber orchestra, grows out of his researches into contemporary flute technique, integrated virtually every manner of sound production available to the instrument. Johnson's down / among the altitudes was based from the book-length poem Anathemata by the Welsh poet David Jones. The passage from which the phrase in the title is taken describes, in a wide-ranging fashion typical of the poem, the changing of the Earth's surface on a geologic time-scale as it intersects with Celtic mythology - itself in turn a distorted reference to the Catholic Mass, around which the entire poem is somehow constructed. Stadelman's Eventyr (Norwegian: "adventure," and also "folk tale) was written for the unusual instrumentation of New Zealand's virtuosic 175 East Ensemble, which Stadelman describes as "a sort of negative 'Pierrot ensemble' with low winds/brass, two low strings, and percussion." Says the composer, "I remember thinking about trying to develop an analogy-in form and time-to the feeling of the way high notes 'sound' when played by low instruments like cello, bass, trombone and bass clarinet." More information at the Center's website. With June in Buffalo over, it's time to take a look back at the Center's past season. The next few posts will touch on a few worthy highlights. Any given semester at UB sees a parade of world-class composers and ensembles. 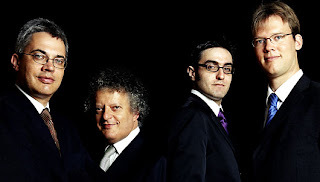 The Arditti Quartet came in late February for a three-day residency, highlighted by a concert at Lippes Hall and a graduate composer reading session. They were joined at UB by composers Brian Ferneyhough, Hilda Paredes, and James Clark, who each contributed works to the quartet's concert program, along with pieces by David Felder and Elliott Carter. Ferneyhough and Paredes gave master classes and lecture/demonstrations. Garaud McTaggart reviewed the Arditti's concert for the Buffalo News: "Based upon its length of service to the cause of adventurous contemporary music and the overall quality of its playing, the Arditti Quartet can take pride in a history that has consistently showcased, in the most honorable manner, a depth of commitment to modern composers that is truly striking." In a more traditional vein, the Lydian String Quartet came to Lippes on Friday, April 24 to perform three Beethoven quartets -- Op. 18 no. 4, Op. 135, and Op. 59 no. 2 -- as part of the Slee Beethoven Cycle. Like the Arditti, the Lydian also participated in a student composer reading session...more to come on this.